Ever had players who wanted to kill eachother for the fun of it, but also have players who'd rather not have pvp enabled? announceDimensionSetting (default=true) Whether or not to display a message when a player enters a dimension with forced PvP settings. The mod is mostly server only, however, since version 1.0.x the mod can also be installed client side. 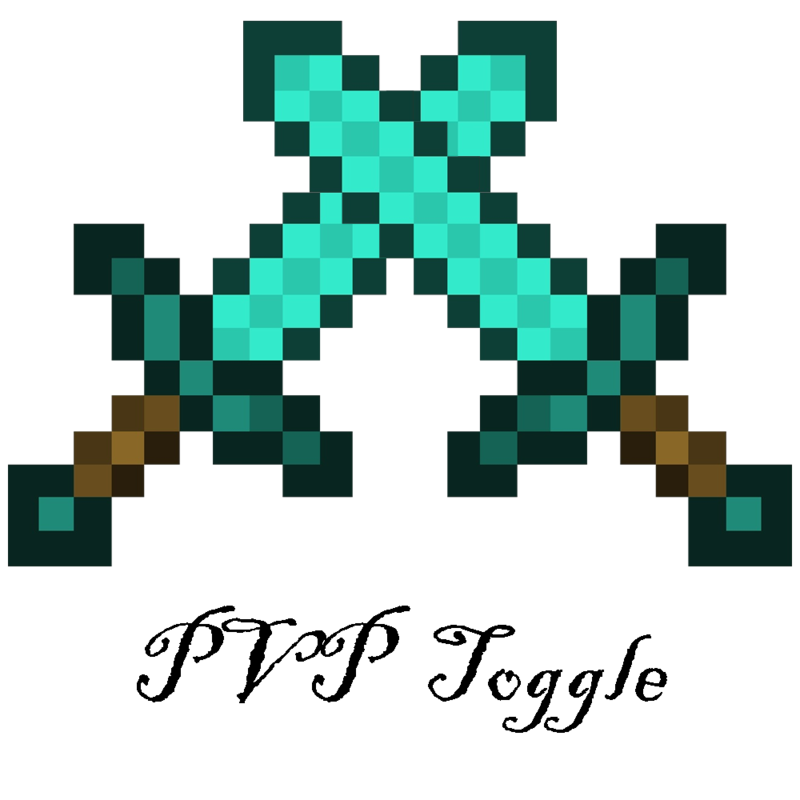 This'll display two swords on your gui when PvP is enabled and a shield when PvP is disabled. location - Sets the location of the icon. own - Whether or not to display the icon. other - Whether or not to display the icon over a players head. new <name> <x1> <y1> <z1> <x2> <y2> <z2> - Creates a new area with "name" in the given coordinates. delete <name> - Deletes area "name"
option get/set announce/forced - Gets or sets the options. Announce is if the mod will notify a user if they enter or leave the area. forced on/off, whether or not PvP is on or off. dimension [get] <dimensionID> -1/0/1 - Gets or sets the settings in the dimension. -1 means not forced. 0 means forced off, 1 means forced on. For PvPToggle (and all my other mods) K4Lib is required! Not able to toggle PVP in 1.7.10 after turning it on. Keeps saying I'm in cooldown no matter how long I wait. in the command console i type "pvp on" but the console replies: "unknown command"
on my server, but it doesnt seem like the mod is running? Yep. Thank you :) Not so much a mac-issue. But i'll put out a version asap. I forgot about that whole upper/lower casing thing forge is enforcing. Will this port to 1.12? Late reply, sorry. Yes, i've already ported it to 1.12 but i'm adding some new features to it. Hope to have a release by the end of the weekend. Keep your eye on my twitter for updates. I'm having an issue where on 1.11.2 get "FML has found a non-mod file pvpToggle-1.11.2-2.0.37-universal.jar" even if its a newly installed server using the recommended version of forge 1.11.2 and only K4Lib and pvpToggle in the mods folder. Interestingly enough, when I created a forge 1.10.2 server and put the 1.11.2 version of pvpToggle in the mods folder it is properly detected as a mod (and then the server stop because its not 1.10.2 compatible). Is there anything I can do to fix this? Has anyone else had success with 1.11.2? Very VERY VERY late reply, i'm so sorry, Curse doesn't send me emails anymore.. It appears i made an error in my 1.11 version, by not lowercasing the mod id. I'll release a new 1.11 version soon. What is the exact order of commands to make a PVP area forced and announced. Iv got an area called "Arena" set and that worked fine. But how to i make the "Arena" area forced pvp with an announcement i seem to be missing the command order in someway. /pvptoggle area option set announce forced<<< does nothing. What am i missing? Is there anyway to make this compatible with vanilla clients? Clients aren't required to have it. I din't get it too work with vanlilla clientes, but Forge clients without mods works fine. Not really sure wat the problem was. Got disconected from the server immediatly upon trying to connect. Have a look trough your server and client logs. Don't really get a specific error message but here are the logs. Hope you can solve it. Is this compatable with just the server having it, or does the client need it as well? Just the server is enough. You'll miss out on some functionality, but the core still functions. Doesn't seem to work on forge 1.7.10 - 10.13.4.1558 without any other mods installed.